iCTLT 2016 is scheduled on March 28-31, 2016 at the Suntec Singapore Convention & Exhibition Centre with the theme “Future Ready: Inspire, Connect, and Transform”. 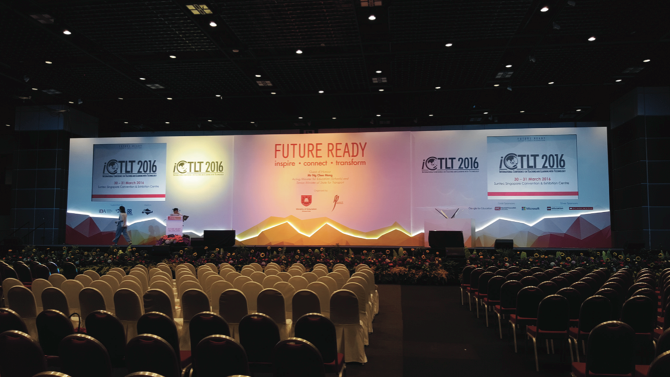 The programme for the iCTLT 2016 is divided into two parts: the main conference and the pre-conference. Transform – create networks of learning communities to further promote ICT in education; provide a solid infrastructure for support and learning. The pre-conference schedule mainly includes a series of masterclasses that delegates can participate in. For the main conference, a lineup of activities that range from panel discussions, paper presentations, model lessons to exhibitions are spread out during several days. After the opening ceremony, a keynote speaker is usually scheduled followed by exhibitions and paper presentations. Model lessons and panel discussions also happen in between schedules. An opportunity to meet practitioners of specific projects.